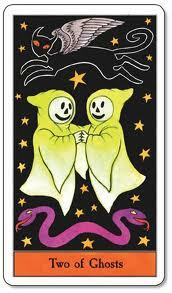 Weekend Reading: Two of Ghosts from the Halloween Tarot by Kipling West. Be on the lookout for a new friendship or love this weekend. If not that, look out for a new quality emerging in a current relationship. This is a time to acknowledge and celebrate the significant others who add to our lives, whether they be lovers, children, friends or partners. Keep things in perspective. The importance of them in your lives is greater than the little things that may bother you in the moment. Let go and let it be a harmonious weekend. You do have that choice.